O lado da montanha da casa possui um grande deck com vista para levantadas Big Boulder Ski Resort e um deck inferior que olha para a floresta. O deck enfrenta Sul com uma metade na sombra de carvalhos que fornece uma escolha perfeita de banhos de sol ou ter um almoço tranquilo na sombra. Duas novas ACs de dois pisos tranquilos resfriar a casa quando necessário. Lake Harmony fica a pouco mais de 5 minutos a pé de um lago privado que permite a pesca, motonáutica, esqui aquático e natação. Nosso Lake Harmony praia comunidade privada tem um salva-vidas, área de natação, mesas de piquenique, e quadra de vôlei de praia. A casa fica a 5 minutos de Big Boulder Ski Resort e 10 minutos para Jack Frost que fornecem esqui, snowboard, e tubos de neve. Outras atracções locais incluem snowmobile, passeios a cavalo, paintball, caminhadas, rafting, pesca, caça, golfe em miniatura, parques aquáticos, Gambling Casino, boliche, cinema, golfe e compras. Lake Harmony está localizado a 90 milhas de Nova York & Philadelphia. Acesso à praia incluído para 10 convidados adultos e número ilimitado de para crianças até 12 anos. My friends and I have rented Anya's house for two years in a row and had a great time each year. Plenty of space, beds, two great porches, and a nice big backyard. Anya is great - flexible and very responsive. We plan to rent it again next year. Warm and welcoming home! Meant for families and fun! We rented this house for a long summer weekend with my 2 siblings and their families (12 people, adults and teens). 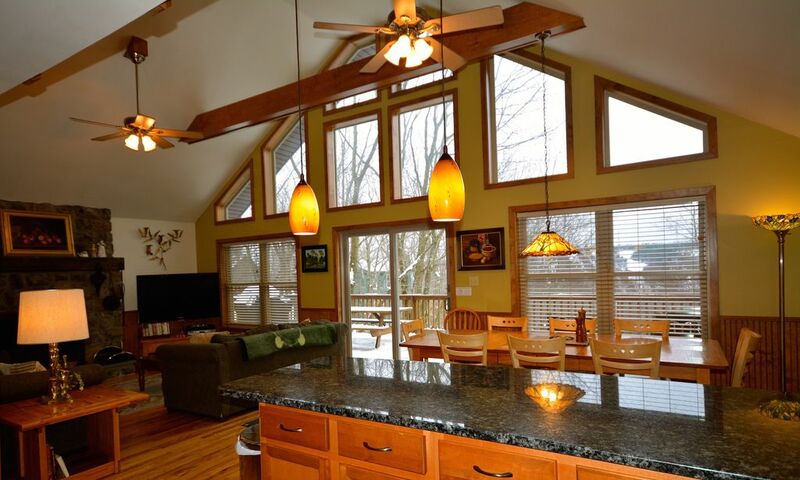 The house was exactly as described in a lovely wooded community a few blocks from the lake. Very clean and kitchen well equipped. There is plenty to do here but honestly we had the most fun just hanging out at the house, playing board games at the huge dining table, shooting pool, enjoying the hot tub (wonderful at night) and hanging out on the upper deck. We were so excited to see deer, a fox and 2 black bears walking through the back yard down to the lake! We were all safely up on the upper deck and we were amazed at these beautiful animals and took lots of video and photos. A highlight of the trip! Friday night we all went to Nick’s Lake House – they were able to seat all 12 of us together! Food was really good, nice variety in menu. They have an outdoor deck and bands in the summer on the weekends which was really nice and a beautiful view of the lake. There were quite a few nice looking restaurants within a 5 minute drive of the house. Saturday evening was so nice we stayed at the house and grilled on the upper deck everyone helped out putting a casual meal together and it was awesome. Owner was very responsive and accommodating, she texted back right away to a question or two that we had during our stay. She also allowed us to check in early which was great. The house is decorated in a homey and warm style which made us feel welcome and relaxed right away we felt right at home! We didn’t get the chance to use the beautiful fireplace but I can see this being a very cozy winter retreat as well. This house is a perfect place to gather your families and reconnect with each other – that’s exactly what we did and we all had a great time!! We enjoyed our weekend. We were three families and were able to relax and enjoy each others company. We attended The Pocono 400, so it was nice and close. Anya was very helpful if there were any questions. Would stay here again. It was an amazing experience yes! We accept Friday and Sunday departures/arrivals; for Saturday arrivals/departures, 2 nights will be billed at the weekend rate. We take mid-week, Monday-Friday, rentals.